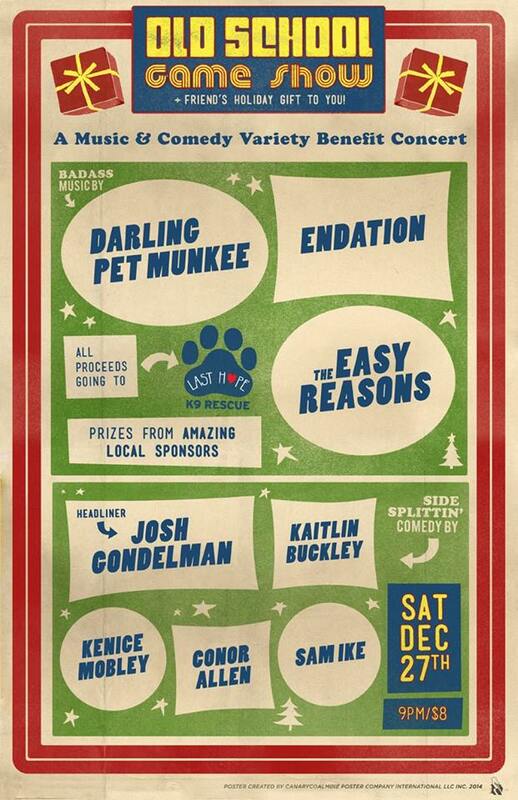 Home » Music » Darling Pet Munkee » Darling Pet Munkee plays Old School Game Show and Friends’ Holiday Gift to You! Darling Pet Munkee plays Old School Game Show and Friends’ Holiday Gift to You! Revel in one last raucous burst of holiday cheer with a night of music and comedy from your friends at Old School Game Show, all to benefit Last Hope K9 Rescue! Rock out with live music from Darling Pet Munkee, Endation, and The Easy Reasons! Win prizes from amazing local sponsors! Laugh at sidesplittin’ comedy from Sam Ike, Conor Allen, Kaitlin Buckley, Kenice Mobley – a comedian and headliner Josh Gondelman, writer for Last Week Tonight with John Oliver! Music, laughter, prizes, AND puppies?!? It’s like Santa never left and decided to move in with you instead and be your best friend! Did we mention that you’ll be helping puppies?